The use or surveillance cameras and security systems are widespread throughout our modern society. Especially with the inclusion of networking and remote access through innovations in CCTV and security equipment, private citizens and businesses alike are all able to utilize the growing benefits of having a surveillance system. Picking the correct equipment for your security system can be tricky, especially if you are stuck with the installation process following your product purchases. TechPro Security is the best team of professionals for the installation of surveillance cameras in the South Florida area. Regardless of the size of your property, TechPro Security guarantees our ability to uphold our exceptionally high standards and provide you with a thorough service ensuring a flawless installation of surveillance cameras for your location and advisement on how to best utilize your security system to have absolute protection. TechPro Security is a team comprised of security professionals that specialize in the installation of surveillance cameras. Located in Boca Raton, FL, our services have ranged from private, residential jobs in need of no more than a few security cameras to entire neighborhoods that requested almost one hundred individual cameras to work on their system. Our installation techs have been a part of the industry for a decade and come with a number of backings that provide our clients with confidence in employing our services. As a whole, TechPro Security is a licensed security installation business, holding its own Electrical Contractor License. Our company is bonded and insured, and our capabilities to supply our surveillance equipment directly with our other business partners enables you to cut costs in every part of the installation process. TechPro Security also provides a lifetime of free technical support between the hours of 9am-8pm and guarantees its products with an additional loaner program in the case of warranty issues. And, to round it all up, we provide free phone apps for both Android and Apple devices to access your surveillance system remotely from anywhere with an internet connection. At TechPro Security we understand that every location and client has a different set of needs that we are happy to accommodate in order to get the most out of your surveillance system. Our professional security installation services do vary depending on that specific job you are in search of. However, all of our individual contractors are especially skilled in their trade and capable of completing any installation task you are in need of. To provide some examples of how each job differs from the next, the needs for a private residential home surveillance system and a commercial or business CCTV system are entirely distinct. The installation process for a single family home can usually be done with the help of only one of our surveillance camera technicians, while the undergoing of a commercial or business security system we typically recommend first a floorplan overview and a site survey. The needs to record and retain all of your surveillance footage on a Digital Video Recorder (DVR) or a Network Video Recorder (NVR) vary from client to client, and our security technicians can advise you on the best-recommended process for a fully operational surveillance system with one easy walk-thru. 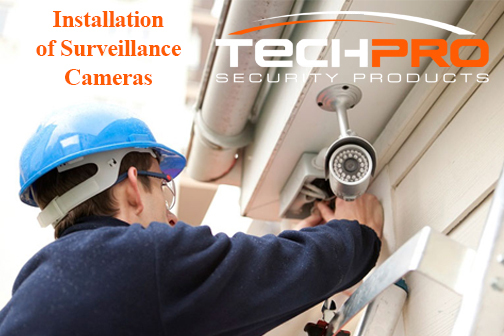 No matter what step you are at in your installation of surveillance cameras process, TechPro Security is there to help ease your worries and provide you with the proper solutions. Our installation of surveillance cameras comes down to a fairly simple five-step process that we will lay out for you below. Step 1: Consultation- TechPro Security offers a free estimate for any potential client in need of security system installation services. Once you have contacted us we will proceed to evaluate your property for free and make the proper recommendations for what security camera products and installation methods best meet your building’s needs. At no point are you under any obligation to employ our services once we have delivered our free estimate. Step 2: Install Schedule- Once we come to an agreement on the price quote we will schedule a date to begin the installation process. Step 4: Assessment- The process where you personally inspect our job and the proper workings of your surveillance system. Step 5: Customer Training- In our final step, we take the time to go over all the ins and outs of your security system, such as how to access footage or make changes remotely, so that you have full control. In addition to our installation services, TechPro Security partners with a few other security companies to ensure you receive the best products and prices for your entire surveillance system. Security Camera King is a wholesale distributor of high-tech surveillance equipment that provides all of the necessary equipment we recommend for the installation of surveillance cameras. Digital Security Guard is a company that we also work with which provides a remote monitoring service so that you can maintain 100% protection every hour of the day, every day of the year. A cheap alternative to a traditionally manned security team, we especially recommend this to allow your system to be proactive instead of reactive in times of emergency. For further information regarding our services at TechPro Security please visit our website and investigate a detailed view of all the services we offer. To obtain your free estimate or consultation Contact Us at the link provided and we will gladly begin the necessary process for getting your surveillance system fully operational.